All our Copper & Brass sheet and wire is supplied Dead Soft temper except for copper square wire. 36 Gauge COPPER FOIL 12 Inches wide X 10 feet long on a roll. is available in 6" X 36" full sheets or 6" X 18" half sheets. 10 cents per cut for each 1/2" and larger piece or individual cut. 15 cents for each additional 1/4" to under 1/2" for each individual cut. 20 cents for any additional cut smaller than 1/4". 25 cents for any 16 and 18 gauge sheet cuts. We can no longer cut 14 gauge sheet. We're just not strong enough. We can not cut sheets length wise beyond seven inches. A trip to your local heating and cooling contractor is advised if you need longer, lengthwise strip cuts as their sheet metal shears have that capacity. Half Sheets are much easier to ship and with less damage due to mishandling by the carrier. If you can use half sheets and need more than one piece, just order by the full sheet to receive the best price and ask that they be cut in half for shipping. Example: Order two sheets of 20 gauge copper sheet and specify you would like them cut in half. That will bring you four pieces that are 6" X 18"
All wire lengths are approximate. There are no further discounts on these base metals. Diameter in Inches .064" .050" .040" .032" .025" .020" .016" .012" .010"
4 Oz. Spool * * 50 ft. 79 ft. 125 ft. 198 ft. 315 ft. 520 ft. 825 ft.
Width in Inches .050" .040" .032" .025" .020"
4 Oz. (1/4 Lb.) 26 ft. 40 ft. 63 ft. 100 ft. 160 ft. Commonly called "Jeweler's Bronze" or "Craft Gold" due to its rich gold color. Diameter in Inches .064" .051" .040" .032" .025" .020" .016"
4 Oz. Spool * * 50 ft. 79 ft. 125 ft. 198 ft. 315 ft.
Yellow Brass (C.D.A. # 260) is an alloy of 70% copper and 30% zinc. 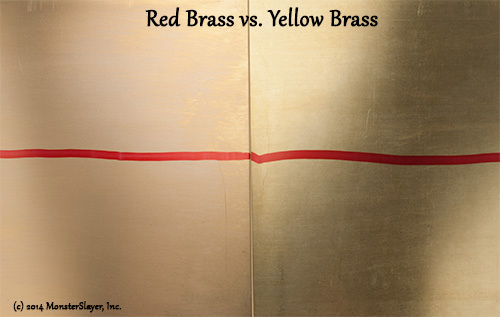 This brass alloy has a very bright yellow color compared red brass. Diameter in Inches .064" .050" .040" .032" .025" .020" .016"